The Mexican Revolution lasted from 1910-1920 and was the first major civil war of the 20th Century. It began in 1910 with an uprising led by Francisco Madero against the dictatorship of Mexican President Porfirio Diaz, spanned the period of the Great War and involved multiple opposing factions which relied on competing German and American support. 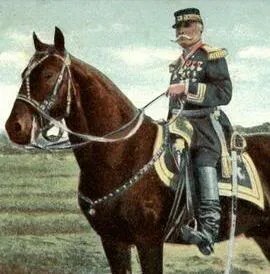 In 1913, power changed hands from Francisco Madero to General Victoriano Huerta who in February had seized the Presidency in a coup initially supported by the United States. As Huerta’s rule evolved into a ruthless dictatorship supported with arms and finances from the German Empire, a series of diplomatic crises occurred culminating in the “Tampico Affair” on April 9, 1914 which involved the temporary seizure and imprisonment of nine American sailors by Huerta loyalists. In response to this provocation the United States then occupied the Port of Veracruz to restrict Mexican commerce, and threw its support behind the opposition forces of Venustiano Carranza who finally defeated Huerta’s armies in battle and wrested control of the Presidency on July 15, 1914. Huerta went into exile abroad in England and Spain where he continued to plot a return to power with German support, the goal of which was to keep the United States distracted from direct involvement in the Great War in Europe. 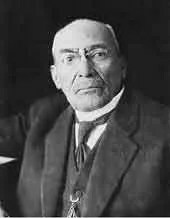 Huerta finally returned to the United States in April, 1915 in order to complete his counter-revolutionary plans, but was arrested in El Paso, Texas on June 27 and imprisoned at Fort Bliss for conspiracy to violate U.S. neutrality laws. After Venustiano Carranza finally took control of the Mexican Presidency in 1914, some of his former military commanders including Generals Francisco “Pancho” Villa and Emiliano Zapata became disillusioned with his lack of promised reforms (especially concerning land redistribution) and turned against him, taking their rebel armies into the field once more. 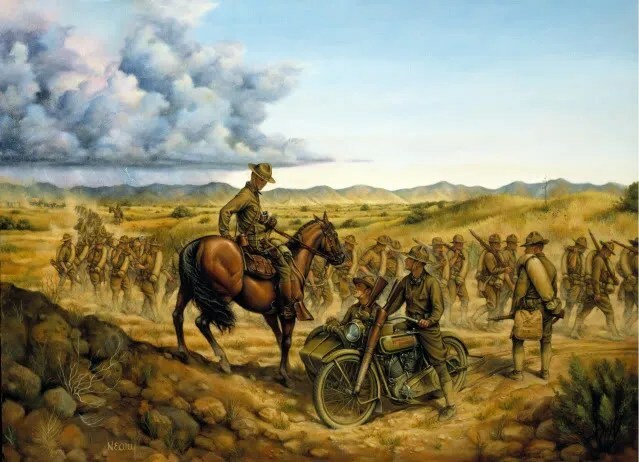 Major engagements between the warring factions and attacks against American interests continued throughout 1915-1916, including a massacre of Texas businessmen on a train near Chihuahua, Mexico and numerous cross-border guerilla incursions into Texas, New Mexico and Arizona. Despite the fact that his Presidency had been formally recognized by the United States, Carranza adopted a hostile posture towards America and instead continued to openly curry favor with the German Empire for financial and military aid. German Army reservists living as expatriates in Mexico also recieved commissions in the “Constitutionalist” army, and were actively serving in the Northern Forces south of the U.S. Border. On March 8, 1916, Pancho Villa crossed the United States border with 500-1000 men and raided Columbus, New Mexico. His motives were two-fold; retaliation for the continued American recognition of Venustiano Carranza’s government, and a bid to provoke direct American military intervention in Mexico that would ultimately weaken Carranza’s hold on power. Villa’s raid destroyed the town and left 24 American soldiers and civilians dead. In response, President Woodrow Wilson dispatched General John J. Pershing and a force of 10,000 regular U.S. Army troops into Mexico on a Punitive Expedition to attempt Villa’s capture. Numerous skirmishes with bands of insurgents and even outright battles with Mexican Army units ensued. President Wilson also sent several divisions of Army and National Guard troops to protect the southern U.S. border against further Mexican raids and counter-attacks which continued to disturb the Border Region in Arizona and Texas from 1917-1919. Read Soldier’s Mail from South on the Border here. ORIGINAL FILM OF UNITED STATES ARMY BORDER SEARCHES DURING THE PUNITIVE EXPEDITION. ORIGINAL FILM OF UNITED STATES ARMY IN COMBAT AT CHIHUAHUA, MEXICO DURING THE PUNITIVE EXPEDITION. My Grandfather, Fred A. Richardson, was a member of the 1st NH Co. H that was with Pershing’s expedition in Mexico after Villa. Fred passed away at age 100, April 11, 1993. I am just starting to look into Fred’s military history. My other grandfather I have spent the past 2 years researching – he was a member of the 96th Company USMC, and has had an incredible part in the forming of the reputation of the Marines – from the battles he was involved in. Fred would later serve in the 103rd Infantry of the famed 26th “Yankee Division” in WW1. Thanks so much! 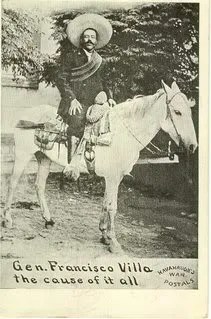 Your grandfather Fred was most probably defending the Border region against Mexican guerillas like Sam did rather than actually pursuing Pancho Villa in Mexico. Nevertheless, he would have been both under fire and the constant threat of attack during his service. Keep reading to learn more about the mission and life that the National Guard had during that footnote to the U.S. involvement in the Great War. In looking over the 103rd Infantry’s Roster while at Camp Devens before discharge in 1919, I see that there is listed a Corporal Frederick Richards #67112 in the Headquarters Company along with Sam. I find no Frederick Richardson, so I suspect this is him, especially since his serial # is low and would have been issued at the time of the 103rd’s original formation. This means that he and Sam would have both known each other and experienced the same things. Read on to follow the adventure that your grandfather shared! My grandfather (Fredrick A Richardson) was a cook for the Army, perhaps that is why he may not be listed with the regular troops? How can I find info on a cook in the Army? I am VERY excited to find this site. My great grandfather was Charles Coffin Gurley. He enlisted in the Mass. NG on July 15, 1913 at Somerville, Mass. He was a private for his entire period of service in K Company, 8th Mass. Inf. National Guard. I have his Reservists Descriptive Card, which shows that he was furloughed on the 5th of August, 1916 at El Paso, Texas. Later, when the Mass. N.G. units became the 104th Infantry, Machine Gun Company (as part of the 26th Yankee Division) he served in France. I have his Discharge paper (prepared at Fort Devens) which contains information about his service record on the back. I also have an interesting handwritten letter from a John J Ward (?) who it appears was either an officer or NCO that my GGF served under. I’m not sure exactly what the intent of the letter is, but it appears to be a simple statement of character and/or to corroborate Charles Gurley’s sevice, as it is addressed to “To Whom It May Concern.” Anyhow, it appears that my great grandfather served in the same company as Sgt. Sam Avery. I have been trying to piece together more information on him for years now and this is the closest link I have ever found. I would be more than willing to share the details of whatever I have, if you are interested. Hi! I am very happy to find this site and am also looking for some help. I am a graduate student at University of Maryland, Baltimore County and am writing my master’s thesis on my great-grandfather’s experience as a border soldier in the National Guard during the Punitive Expedition. I know that he served in the 28th Infantry, Company D. His name was Thomas Fail Cunningham. He served during the Punitive Expedition and then was part of the 1st AEF under Pershing to France. He was injured prior to the “big” battle that his unit was in (at least from the documentation that I can find) and was sent to a hospital in France before returning to the United States on the USS Pocahontas to a VA hospital in Asheville, NC. I am writing my thesis on the overall experience of National Guard troops during the Punitive Expedition and would like any help you could offer. Any suggestions for material to use in research or for books to read about such topics would be greatly appreciated. Thank you so much. I have enjoyed looking at and reading your website. My Great Grandfather Albert Bradley was involved with the Mexican Expedition. He was from Maryland. How can I find out for sure. He passed away in 1972 and was a very quiet man. He didn’t talk about his life., but I do remember a picture in my great grandparents house that was of a wideshot that had tents and in one corner said Eagle Pass, Texas. I have read everything that I can find and even used the internet with hopes that I could find at least a list of the Maryland National Guard that served in the Mexican Expedition. I recently bought a grouping of photos and newspaper clippings ID’d to Richard E. Stickney, USMA Class of 1915. Clippings mention his service with the Punitive Expedition and promotion to Lt. Colonel with the 101st Infantry. Could you direct me where to find more information on this soldier? Thank you for your time and this great website! 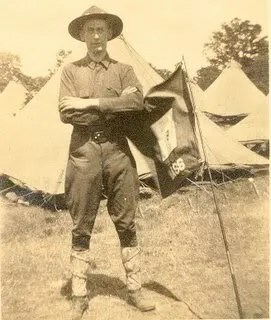 Looking for any information on Roy Jackson who served with the Massachusetts National Guard during the Mexican Punitive Expedition, then with the 26th Yankee Division during World War 1. I believe he may of been with a Field Ambulance. He is buried in Long Island New York. He married Gertrude Stevens in Union New Hampshire in 1906. She was born in Yonkers, but parents may of moved to Boston. Roy was born in 1881 in Nova Scotia and died in 1964, living in the Upper West Side of NYC. THIS WILL BE UNUSUAL…. to say the least !!!! My DAD was in the Mexican conflict with Poncho Villa…. YES that is right – my “DAD”. He was with the 1st N.H. Reg. that went to Laredo, Texas. I think he was with the signal unit – as I have pictures of him with his “FLAGS”. His name is Leonard Louis LaFlam … He was born 2/19/1888. Can you help with more info … or head me in the right direction? I got to serve three tours in Viet Nam …. and I am 100% service connected disabled. The wrong generation for computers, so ANY help you – or any of your readers – may be able to offer me …. I will greatly appreciate. THANK YOU FOR ALL YOU DO !!!!! Since my last post … I have found that my dad was in Co M 1st Infantry New Hampshire National Guard. He was in the “signal corp” that was the “FIRST” wireless telegraph, it’s service was used between the border to Pershing’s headquaters. I STILL can NOT find any rosters of the men who were there. CAN YOU HELP ??? I just found this website, it’s great! My sister and me have been trying to find any record of our Dad’s (Joseph James Morott) service during the Mexican expedition. Like another comment that I read, my Dad too, was a quite man and didn’t speak much about his military service. We know that he was born in 1898 or 1899 in Pennsylvania according to what records say and that he entered the military when he was 14 years old but was booted out for lying about his age. Then when he reached 16 years, he joined up again. Dad also served in the military during WWI and WWII. If there is a roster with him listed as a soldier during the Mexican Expedition, I would love to see it or any pictures. I remember seeing a picture of him on a Calvery mount, but do not know who has that picture. If any one can help, it sure would make me happy. Thanks so much for your website. Yeah I have been trying to find military records on my uncle, John Mick, Sgt Troop M, 13 Calvary who was in the Mexican Punitive Expedition. National Archive files here in St Louis don’t seem to have much information (due to a fire that burned a lot of files). All I’m looking for is a roster/muster of who actually fought. I’m looking for any military records relating to his service. My name is Art – and I see your post on a website about 1st Infantry New Hampshire National Guard. Your Grand father was in Co “A” 1st Infantry N.H.N.G. My “DAD” was in Co “M” of the 1st Infantry N.H.N.G. 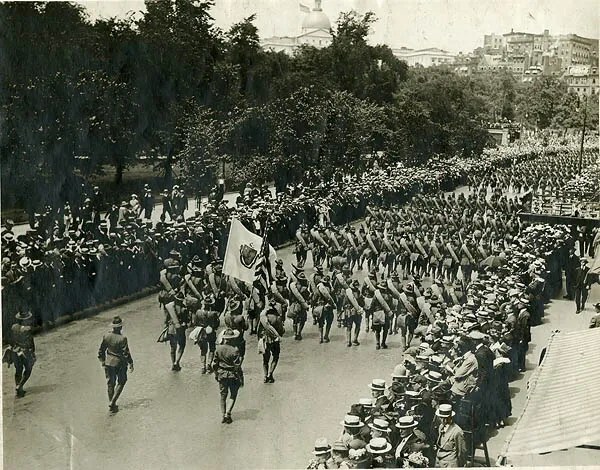 it’s service was used between the border – AND Pershing’s headquarters. I have a picture of him with another signalman with their flags. 1st Infantry Co. M N.H.N.G. I would be willing to scan and email any of my info to you … if you so desire. So when I say “These men we are researching – should NEVER be FORGOTTEN” ….